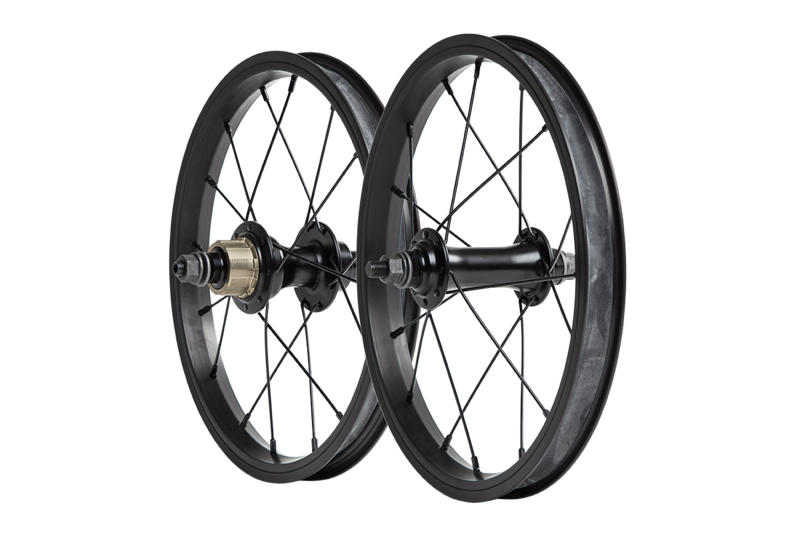 These are the only wheels this size that we are aware of that use an actual freehub (not a freewheel, or the horrendous coaster brakes that come on most kids' bikes). The Shimano pattern freehub also means that you can change the gearing with commonly available cogs. We lace our sealed bearing, alloy hubs with 16 spokes to light single-wall alloy rims. Oh, did we mention a hollow rear axle? You will not find a better wheelset in the world for a 14" bike. Rear wheel comes in at 580g and the front wheel weighs 475g with rim strips. Wheels are a direct replacement for the Yoji 14". 10mm male axles front and rear. Rear wheel will require a cog, spacers and retaining nut for use. Rim strips are included.